…the ambience was excellent with great food and comfort, but the most remarkable aspect was your kindness. I was able to relax like never before…. I hope it will not only be a souvenir, because I'm going to be back with all my family. a fair and unique hunt - a hunt like that is seldom found nowadays. I shall come again! …perfect food, perfect hunting, perfect company and as always perfect scenery. We are looking forward to coming back and visit you again. To sum it up: in all my many years as a hunter I have hardly experienced such a harmony of hunting, hospitality, nature experience. Perhaps I can come again! One of the things that hunting has done for us is to provide a medium to make new acquaintances around the world as was with this hunt. What's different this time is the very special people we met in you Walter and in you Zita and also in your two fine sons. This trip is forever going to be very special in our hearts and memories. It has never been better than this trip… it adds a new dimension that puts it on a higher level that goes beyond expectations. Thank you for the privilege of knowing each of you. 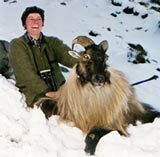 First we were a bit skeptical to come and hunt Tahr and Chamois in NZ,..., now we all return back home successfully..you two are the proof that a good team needs at least two competent people. Without your knowledge and hospitality this wonderful hunting experience and this memorable stay in NZ would not have been possible. The third hunt in NZ - dear Walter, let's hope that your hunting instinct and your courage be passed on to your sons - so that my son can experience such adventures one day. Totally satisfied and a bit tired shall we now travel back to Europe. Thank you for the unbelievable adventure in the Southern Alps. Beautiful country and Walter, very informative and hard working as a hiker, hunter, tracker! 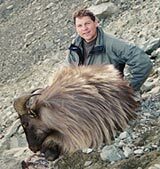 The Tahr hunt exceeded our expectations as did the country and your generosity. 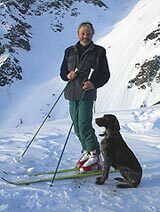 I traveled to New Zealand as an optimist - what I experienced would have surprised even the biggest optimist: not only the carefully planned, fair hunt in an exceptional hunting area, also the accommodation in the comfortable tent, the excellent meals provided by Zita - all those experiences plus some outstanding trophies to take back home now. Thank you very much. Thank you for the beautiful days I could spend in NZ. It was challenging, I have learned a lot, especially that if "you really want to do it - then you can do it"! I hope that we will meet again.